A delightful Tuscan dry red produced just outside the quintessential hill town of Montepulciano. 2011 was a warm vintage, and the heat comes through with lots of juicy red cherry fruit, some rose hip floral notes, light herbs from the wild thyme & rosemary growing in the nearby woods, and a hint of cocoa. Delicious. Do like I do when I'm in Tuscany and pair this with a nice pasta dish, like garlicky pici all'aglione. It's great with grilled sausages and polenta, or enjoy with Tuscan soups like ribbolita or pappa al pomodoro. 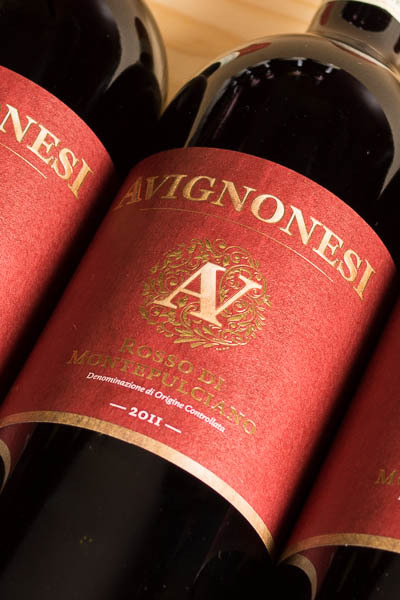 The folks at Avignonesi have a nice website if you want to learn more about their wonderful wines. I really like this easy-to-drink Sangiovese from Avignonesi, with many of the characteristics of a Vino Nobile but at an easy price. Ripe red cherry, fennel, wild thyme and cocoa come through. Tasty.